On Friday, Sep 7, 2012, the eighth annual "Tee It Up for the Troops" National Day of Golf tournament was held at Mendakota Country Club in Mendota Heights, MN. The event, part of the national Tee It Up for the Troops program, is a charity organization that supports veterans and their families. The event's opening ceremony was marked with a fly-over of five WW II era aircraft--four T-6 Texan* aircraft and the Commemorative Air Force's "Red Tail" P-51 Mustang. The aircraft departed Fleming Field in south St Paul, overflew the event, then recovered at their home airfields in the Twin Cities area. I had the opportunity to fly in one of the T-6 aircraft--my first T-6 flight and first opportunity for air-to-air photography. This was a great experience! I'd like to thank fellow Commemorative Air Force member and photographer Gary Chambers for helping to arrange the flight. I'd also like to thank my pilot, Robin Crandall, for allowing me to fill the back seat of his SNJ and for sharing the experience. Following are a few images from the flight. Viewers may right-click download images for their personal use. To download, hover your mouse over the image, select the desired image size from the pop-out menu on the right, then right-click to download. You may also purchase images at cost. * The North American Aviation T-6 Texan training aircraft of WW II was known by several names, depending on what service was operating the aircraft. 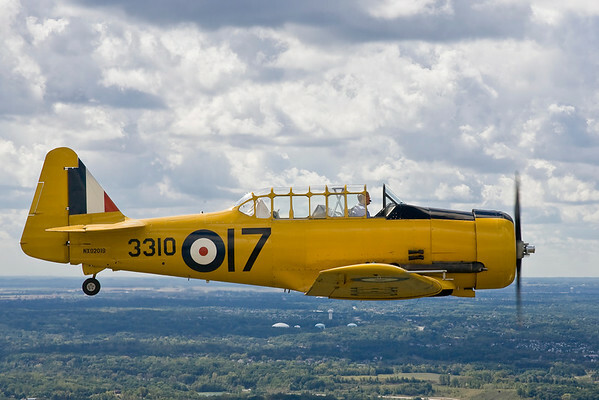 The U.S. Army Air Force called the aircraft the Texan; the U.S. Navy referred to it as the SNJ; our British allies and her commonwealth partners named it the Harvard. All aircraft were basically similar, having minor technical differences.